New exciting promotion on ALL Mirage Floors! 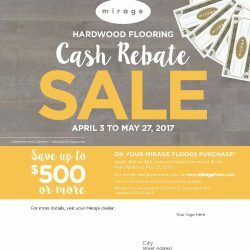 From April 3 to May 27, 2017, consumers get a $0.50/sf rebate on all Mirage floor purchases. Stop in today and check out all of the beautiful Mirage hardwood flooring options!